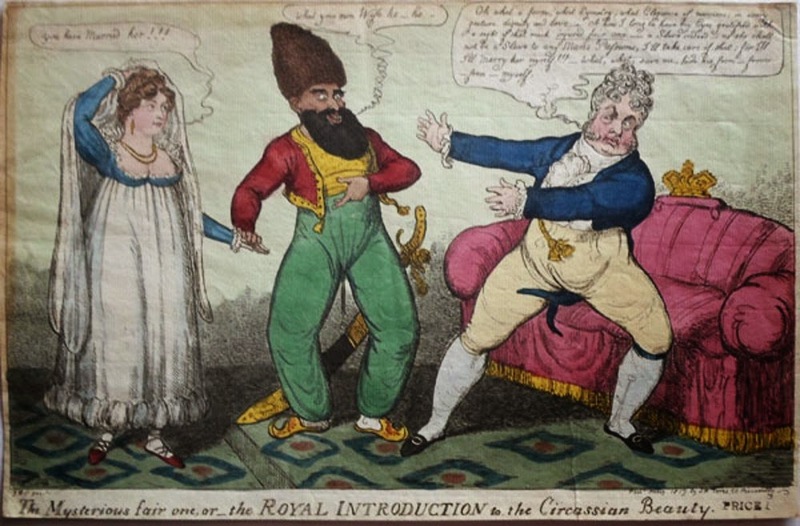 George, the Prince Regent, loved women. All but his own wife, Caroline of Brunswick. The Prince was disgusted by her coarse manners and poor personal hygiene and refused, after their wedding night, to consummate the marriage again. For the rest of her life, he would try to get rid of her, which elicited people’s compassion for the slighted Princess, and instigated a slew of satirical prints about their marriage. At this the fair Circassian raises her veil and exclaims, “you have married her!”. The exotic foreigner turns out to be none other but his wife, the Princess of Wales. The Regent is horrified and cries out: “What, what, save me, hide me from – from –from – Myself.” Only the Persian ambassador isamused. He laughs: “What your own Wife ha- ha”.